Saving lives at birth. Powering clean energy solutions in agriculture. Inventing new tools to teach a child to read. Across development, we’re calling on the world’s brightest minds to tackle our toughest challenges. In the last few years, we have helped launch five Grand Challenges for Development that have rallied students and scientists, innovators and entrepreneurs to tackle some of humanity’s toughest problems. Today, we face just that kind of challenge—a global health crisis that is in dire need of new ideas and bold solutions. From Guinea to Liberia to Sierra Leone, Ebola is devastating thousands of families, disrupting growth, and fraying the fabric of society. 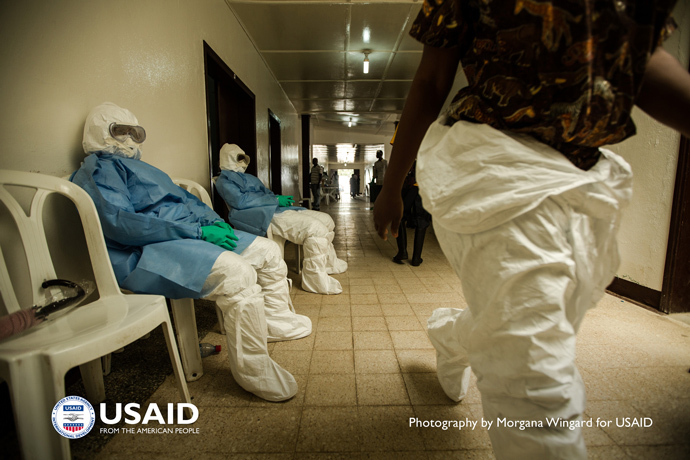 The United States is helping lead the global response to the epidemic, but we cannot do it alone. That is why President Obama launched our sixth Grand Challenge. Fighting Ebola: A Grand Challenge for Development is designed provide health care workers on the front lines with better tools to battle Ebola. To help kickstart this Grand Challenge, some of our nation’s most innovative problem-solvers will gather in DC today and tomorrow to work on this issue. We’re also inviting people from all over the country to share their ideas. You can add your thoughts and see what other people saying here. As the United States and the international community work to contain the worst Ebola epidemic on record, courageous men and women are performing critical tasks every day to save lives and prevent the spread of the virus. Personal protective equipment (PPE)—the suits, masks and gloves the health care worker wears—is their primary protection, but it is also the greatest source of stress. In these hot and uncomfortable suits, health workers must administer to the patients and remove contaminated materials. Together with the White House Office of Science and Technology, the Centers for Disease Control and Prevention, and the Department of Defense, Fighting Ebola seeks new practical and cost-effective solutions to improve infection treatment and control and provide better care to those who need it most. The first part of the initiative is an open innovation platform powered by OpenIDEO, one of the world’s top design firms. Through it, the global community can brainstorm, collaborate, and comment on new ideas that generate practical solutions to the Ebola epidemic. The strongest ideas may be encouraged to apply for funding later in the Grand Challenge. Our aim is to begin funding ideas in a matter of weeks. Over the last several years, we’ve found that Grand Challenges not only generate inventive tools and breakthrough technologies, but inspire us to confront seemingly insurmountable challenges—and succeed.